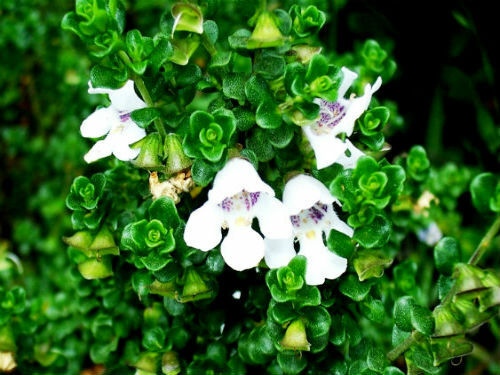 Prostanthera cuneata, Alpine Mint Bush is a delightful dwarf to medium spreading shrub. The strongly aromatic leaves are roughly oval in shape and taper to the base. They are dark green above and paler beneath. Flowers are 1.5 centimetres long and white with coloured blotches in the throat. They are said to be sweetly fragrant. This is a feature we have not detected. Flowering occurs between November and April. Growth habit, foliage and flowers are attractive features. Tip pruning is appreciated. P. cuneata is found in high altitude regions of NSW, Victoria and Tasmania. The Alpine Mint Bush together with Grevillea australis are often the dominant shrubs in alpine areas. “Alpine Gold” is a cultivar with green and gold variegated foliage. The species name is a Latin word meaning wedge-shaped and refers to the foliage.